From a private collection, a group of 4 brass violin or luthier planes marked W E Hill & Sons. Very much in the same style as those much sought after examples by Norris and Preston. W E Hill & Sons were renowned makers of violins and other string instruments with a reputation for excellence in bow making. 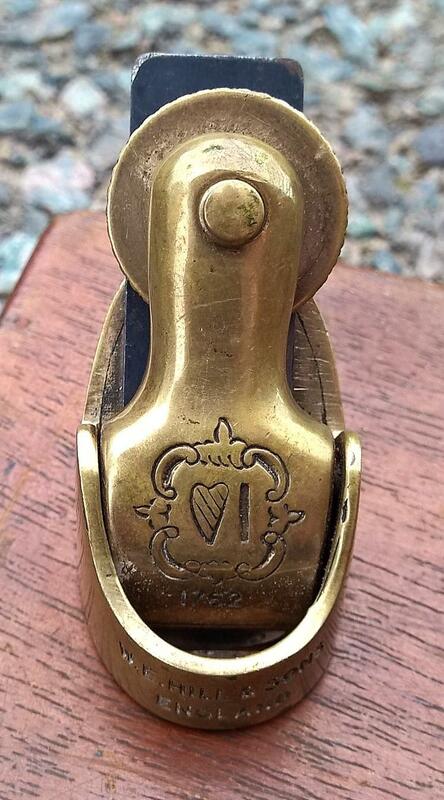 Their crest/trade mark and the date '1762 is cast into the cap with 'W.E.HILL & SONS ENGLAND cast into the toe. A great deal of information relating to Hill & Sons is available on the internet but nothing obvious relating to the 1762 date. Although various ideas have been put forward no one really knows why these planes were produced with the Hill name and mark or if they were produced by the same as those by Norris or Preston. That said, they are obviously quality items and no doubt would make a fine addition to any luthier's tool kit or collection.